People love all wooden product for their house decor, outdoor and indoor game, a gift, souvenirs, or for business. The reason why people prefer to choose wooden product than other, because wood material is very unique and mostly the wooden product is carved by craftsman. Handmade and carving product is very worthly and unique, so that most people like to decorate their house with handmade product. This time we introduce you to something different than another. It called “Wooden Giant Egg”. It made of the best quality of Teak wood and carved by professional craftsman from Java island. Very perfect for your house decoration outdoor and indoor. 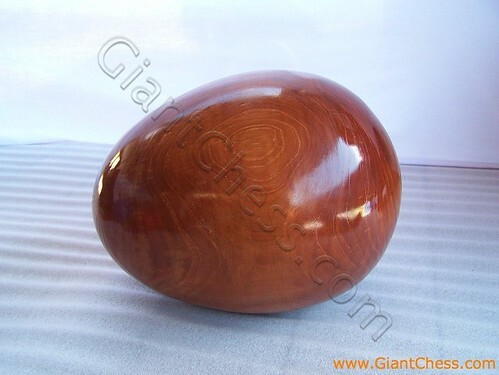 The wooden egg polished in brown or natural wood color, it very unique and unusual. You can put it in your living room or your children bedroom. It is very durable product for outdoor use because it made of Teak wood, the strongest wood in the world.